Last year on March 20th, Francois Payard, world-famed pastry chef, organized the first annual Macaron Day in New York City. As described on its official website, "Macaron Day NYC is inspired by and coincides annually with the Jour du Macaron in Paris, created by la Maison Pierre Hermé in association with the Relais Desserts." All participating bakeries were to offer free macarons to customers that day in celebration of the Jour du Macaron in beloved New York City. A portion of the day's macaron sales at participating locations will be donated to City Harvest, the world's first food rescue organization dedicated to feeding the city's hungry men, women, and children, serving NYC for over 25 years. Fortunately, this year I knew March 20 was the day to be celebrating and eating macarons, so Marcus and I set forth on a mission to hit a majority of the bakeries on the participant list, making a point to hit ones that were in close neighborhood clusters making for easier travel as well as to try bakeries we've never been to. First, I'd like to note that I properly readied myself for the big day. 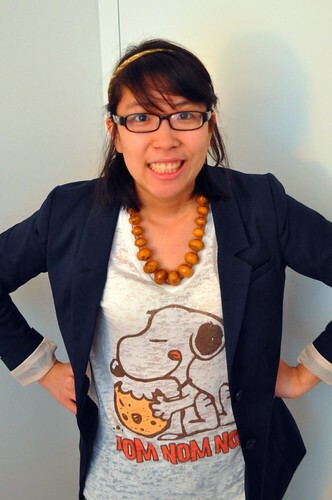 I wore my Snoopy graphic tee with "NOM NOM NOM" emblazoned on it. This was serious business we were about to embark on. So Marcus and I set forth once again on a walk over the Brooklyn Bridge (just as we did to make a visit to Grimaldi's Pizzeria back in November 2010). We made it over in about 15-20 minutes, making our way to Water Street, where Almondine Bakery, our first stop, is located. 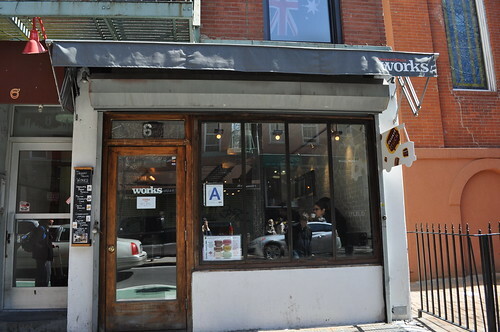 A friend of mine had mentioned this bakery to me couple years ago, but I never had a chance to make it over here because it was located over in Brooklyn. Little did I know it was right over the Brooklyn Bridge! 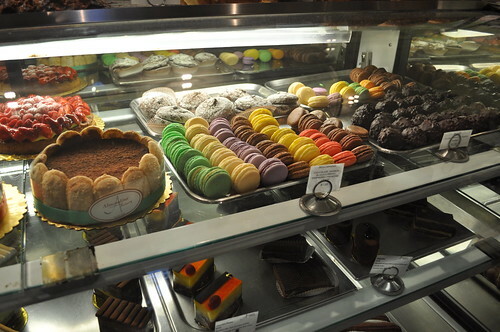 Right when we walked in, I saw the macarons, in all of its bright, food-colored glory. Only problem was that I didn't see anyone asking for free macarons, so I immediately felt bad for wanting to walk in for a free macaron and walk out without purchasing anything. Also, it was around noon, and Marcus and I hadn't eaten any breakfast, so it wasn't forced or anything. Besides, all of its pastry goodies looked so delicious! Because everything looked so delicious, I couldn't decide which route to go on (e.g., croissant, madeleine, sticky bun, etc. 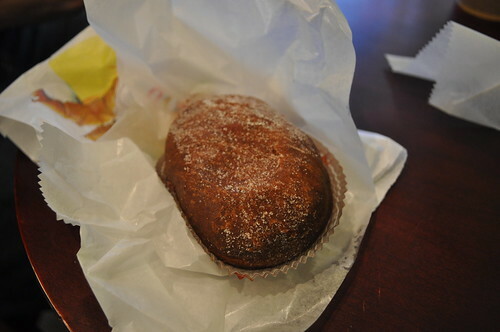 ), but when I saw the guy in front of me order a couple beignets, I just went for it and ordered a beignet, deep-fried choux pastry filled with raspberry jam and sprinkled with sugar, later discovering it's the bakery's weekend specialty. Marcus ordered a hot chai. I loved the beignet dough--it was very soft and light. The jelly, on the other hand, was a little too sweet, a little too much, and a bit sticky. If it had about half as much jam, it would've been perfect for me. 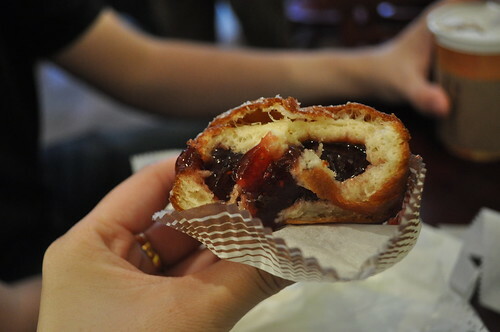 Perhaps, it's because I'm not totally in love with jelly doughnuts, but if you're a jam/jelly/preserve lover, this is the beignet for you! Nevertheless, it was mostly enjoyable. Marcus and I each got a free macaron, after we asked if the bakery was celebrating Macaron Day (as instructed by the website). I got the chocolate (left), and Marcus got pistachio. 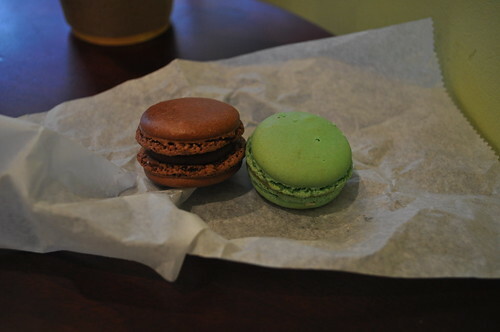 Chocolate was pretty standard (not much stood out), but the pistachio was very nutty and had lots of pistachio flavor! 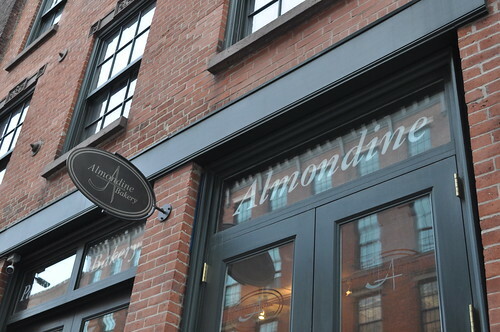 Almondine Bakery made for a great start to our macaron shop hopping adventure that day. 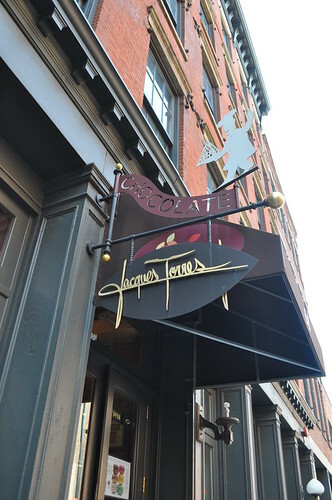 Coincidentally, Jacques Torres Chocolate, another participant, has a location directly across the street from Almondine Bakery. 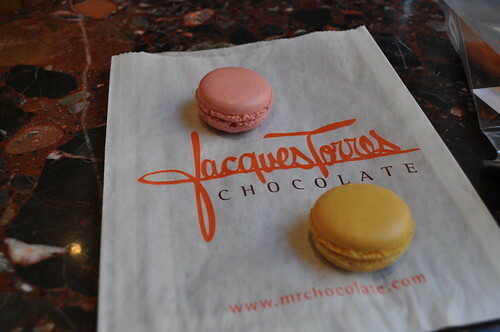 Since we were already there, Marcus and I decided to just walk over and sample a macaron there, too. Jacques Torres, the youngest Meilleur Ouvrier de France ("Best Pastry Chef of France" competition winner), spent eleven years as Executive Pastry Chef at Le Cirque before opening his own chocolate boutique, Jacques Torres Chocolate, where he refers to himself as Mr. Chocolate. I asked for raspberry, and Marcus asked for lemon. The raspberry was pretty good, but the lemon was great! Very refreshing. Marcus even noted that this is probably the best lemon macaron he has had to date. We then took the F train to 2nd Avenue and walked over to Clinton Street, where DessertTruck Works has its bakery. Love the DessertTruck cut-out sign sticking out on the right side! Jerome Chang, former sous pastry chef at Le Cirque, left in 2007 to start DessertTruck, a high-end dessert truck at "dressed-down" prices, with his business school friend, Chris Chen. It became a smashing success, leading them to open up this store front, DessertTruck Works, on the Lower East Side with two former Le Cirque alumni, Susana Garcia and Vincent Jaoura. 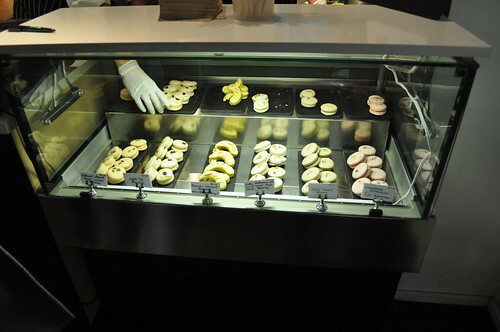 Here is the case of macarons at DT Works! Notice the yellow ones that are in the shape of bananas because they are banana-caramel flavored! Incidentally, Marcus and I will be taking a macaron making class here at DT Works in June, so stay tuned for my full details on that later this spring! 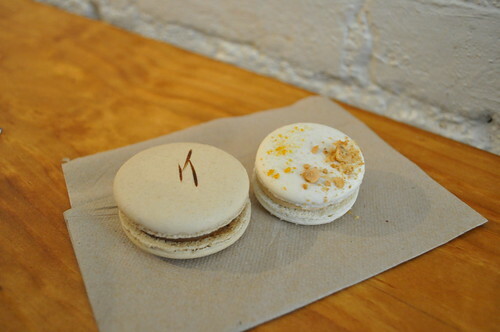 Marcus selected the salted caramel, and I, the praline butter cream macaron with a hint of Meyer lemon. We overheard one of the DT Works attendants say that these two are his favorites, so we chose wisely! The salted caramel was done really well--not too sweet with the hint of saltiness making for a great sweet-and-savory macaron! It was one of Marcus's favorites of the ones we sampled that day. 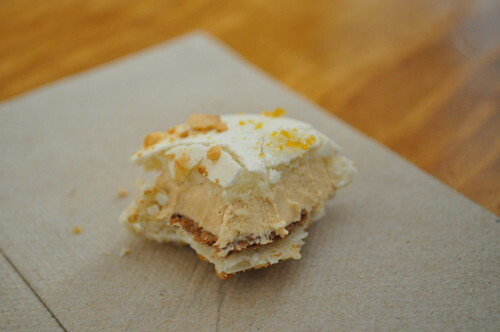 The praline, I'd have to say, was my top favorite of the day. It was nutty, buttery, and lightly sugary with brown sugar. I liked the added bonus of the nuts on the macaron's exterior. Marcus said it tasted like a Fig Newton for him. 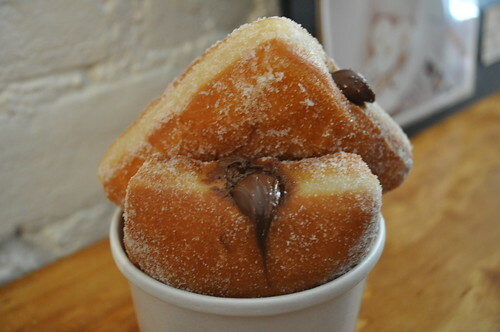 As an extra added treat, Marcus ordered donut squares, which are yeast-risen doughnuts with Nutella filling! When we arrived, they notified us that they wouldn't be ready for at least another 15-20 minutes, so we decided to wait. It was definitely worth the wait! I think one thing's for certain--I prefer my doughnuts/beignets to be filled with chocolate! Since they were just fried shortly before we ate them, they were still warm and light, and the Nutella was on the runnier side, too. Nice consistency for a fried doughnut! Marcus found it a little messy but still delicious! My motto is you can never go wrong with more Nutella! 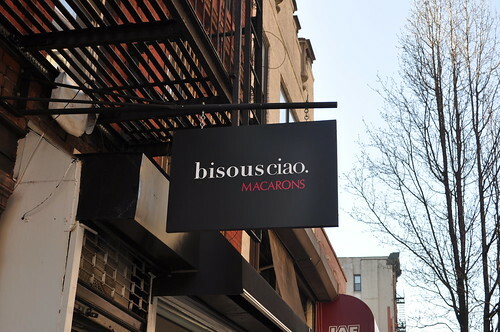 We continued through the Lower East Side to bisous, ciao., a boutique-style macaron shop. 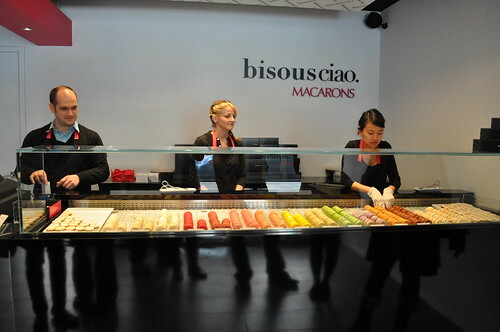 Most bakeries that serve macarons also sell other sweet goodies, but bisous, ciao. only offers macarons--a bold menu! 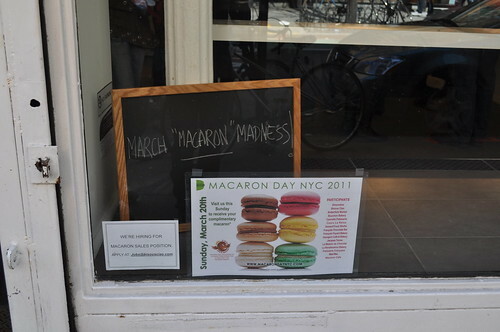 I liked the chalkboard that read "March Macaron Madness!" Quite appropriate for Macaron Day in NYC! The macaron counter reminds me of the haute chocolate counters where you choose by flavor, by piece. I also like the minimalist layout of the shop. It cuts straight to the point--macarons, that is. The free macarons they were giving out at bisous, ciao. were a dark chocolate ganache surrounding salted caramel. However good that may sound, this was just okay for me. The exterior was kind of heavy, and while the interior had really good dark chocolate, the added salted caramel just didn't seem right to me. 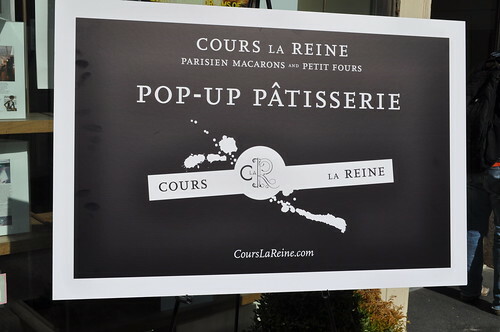 Our next stop was at the pop-up pâtisserie, Cours La Reine, at Eva Scrivo Salon in NoHo. Created by Taryn Garcia, Cours La Reine comes from the annals of French history. Per the macaron creator's website, the Cours La Reine, commissioned by Queen Marie de Medici in 1616, "became a popular eating place for the nobility where young aristocrats looked for husbands and wives of equal rank. One of the oldest parks in Paris, and part of the Champs-Elysees, this beautiful place can now be enjoyed by all." Chef Garcia worked as an associate producer on media television shows like Barefoot Contessa and Martha Stewart Everyday Food, which later led her into the area of food styling, inspiring her to further her education. She attended the French Culinary Institute's La Technique. From there, a trip to Paris reignited her love for the French pastry arts, when she came across the Parisian macaron, "a symbol of beauty and class." Shortly after, she moved to Paris to attend Ecole Superieure de Cuisine Francaise Gregoire Ferrandi. Upon graduation, Ms. Garcia completed her training with famed and noteworthy French pastry chef, Arnaud Larher, incidentally a recipient of Meilleur Ouvrier de France title (just like Chef Torres above). Here is the pop-up shop set up in the front of the salon. Ms. Garcia is on the right. There were so many wild and original flavors to choose from (more to share shortly), but after much contemplation, Marcus decided on the lemon yuzu (the latter is a Japanese citrus fruit), and I, the guava bergamot (the latter is a type of orange). Marcus liked this macaron as much as the lemon one from Jacques Torres, as they both have a really strong citrus/lemon flavor--in his words, "actually tastes like a lemon." I enjoyed mine in a similar way--I liked the citrus accent that the bergamot added to the guava flavor (which made the macaron actually taste like a guava fruit). 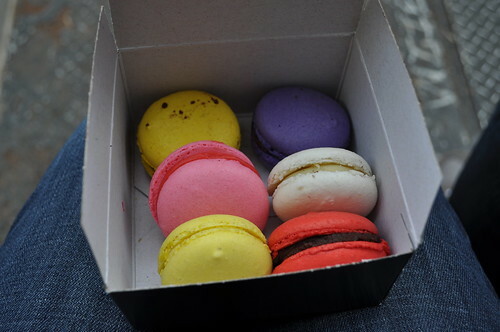 Since I was dying to try more of the flavors, Marcus and I gave in and bought a box of 6 macarons at Cours La Reine. Since Marcus devoured his macaron in a matter of seconds, I opted to get a lemon-yuzu macaron for myself (bottom left). Going clockwise from there, I also got a campari-pamplemousse macaron (pink) and a passion fruit macaron, while Marcus went with a cassis-violet de Toulouse (purple) and a Tahitian vanilla macaron (white). The one in the bottom right corner is a pomegranate-pur caraibe dark chocolate I chose as our last one. The campari-pamplemousse consisted of Campari, an Italian, mildly butter apértif, and grapefruit (the latter word is simply just French for "grapefruit"). It made a crazy combination that tasted like a tropical drink that you'd enjoy on the beach. Plus, you could really taste the Campari and the grapefruit flavors! 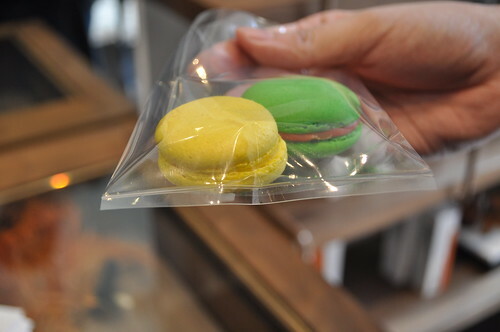 The passion fruit macaron was lightly sweet with the expected tang characteristic of the fruit. The cassis-violet de Toulouse macaron had a strong (and delicious) black currant flavor (from the cassis, which is a black currant liquer), but I couldn't catch the violet. It was probably because I didn't know to look out for it! 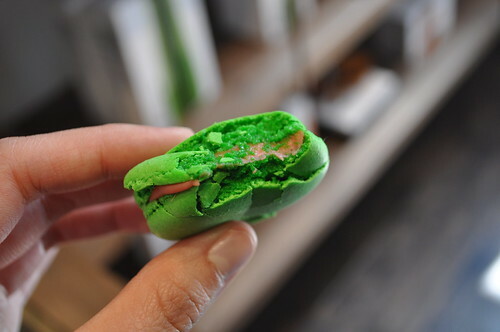 Marcus really enjoyed the Tahitian vanilla--"Probably the better of the vanilla macarons I've had," he reports--particularly because black specks from the fresh vanilla bean used. This certainly makes a difference in producing a more substantial amount of flavor. Lastly, the pomegranate-pur caraibe dark chocolate reminded me of the berry-accented dark chocolate that is sandwiched between a Pepperidge Farms' raspberry Milano cookie, the same way a few fresh raspberries add that needed tartness to an otherwise simple flourless chocolate ganache cake. Definitely our favorite stop of the day (next to DT Works)! Our last stop was at François Payard Bakery (FPB), the home to Chef François Payard's gourmet pastries and sweets. The organizer of Macaron Day NYC, Chef Payard grew up surrounded by classic French pastries, attributable to the tradition carried by his parents and grandparents at his family's bakery on the French Riviera. As an adult, Chef Payard moved to Paris, where he "learned the artistry and refinement of transforming traditional desserts into exquisite plated presentations whose taste, texture and originality opened new horizons in his career." From there, he landed the position of pastry chef at two three-Michelin star rated restaurants in Paris. He soon ended up in New York City, where he worked as pastry chef in the kitchens of Eric Ripert's Le Bernardin as well as of Daniel Boulud's Daniel. A few years later, he won the James Beard Award for Pastry Chef of the Year in 1995. In 1997, he was finally able to open up a restaurant of his own called Payard Patisserie & Bistro, which unfortunately closed its doors in 2009 due to loss of its lease. 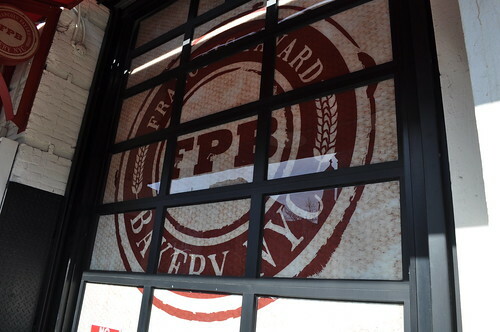 Since then, Chef Payard has expanded both nationally (Las Vegas) and internationally (Korea and Japan) while opening up two new locations here in New York City, including FPB and François Chocolate Bar. 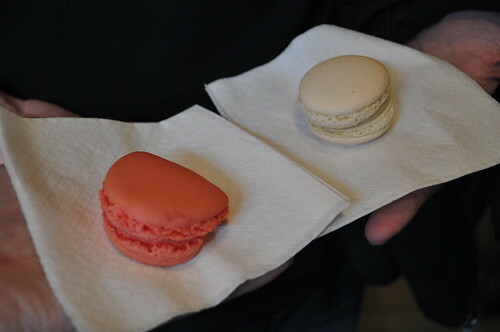 FPB offered three types of free macarons: cranberry, vanilla, and passion fruit. Marcus chose the vanilla, while I went with the cranberry. We were a little bit disappointed with these macarons. Maybe it was because we had so many other macarons already that we were hitting that threshold, but really, we just thought these were a bit bland. There was a hint of flavor there, but not as powerful as the ones we had previously at Cours La Reine. You could definitely tell what flavors they were, but it just wasn't spewing in flavor. 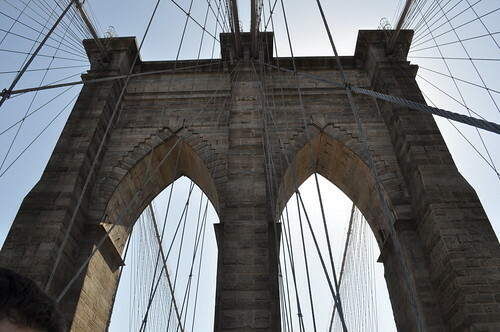 Findings: Marcus and I were really glad to participate in celebrating Macaron Day NYC by trying out six new bakeries we haven't been to for macarons--plus, we were able to walk over the Brooklyn Bridge again for a cause! I'm really glad we trekked from 11AM to about 3PM in search for some good, solid macarons. We discovered two new favorites (DessertTruck Works and Cours La Reine), along with tried new desserts at bakeries we haven't been to before! Having the opportunity to try the macarons offered at DT Works has made me even more excited for the macaron baking class that Marcus and I will be taking in June over there! The reason why I've fallen in love with the macarons at DT Works is mainly due to execution of texture and depth of flavor, from a chocolate/sugar/candy perspective. And the reasons are the same for Cours La Reine, but with respect to depth of flavor, I will have to say it is mostly from a fruit perspective, as most of the macarons we tried contained a fruit or two in each. So if you want to get your hands on some quality macarons, please go to DessertTruck Works and Cours La Reine. I promise you'll be raving about them in no time! 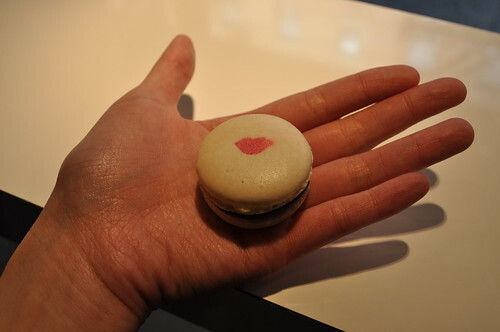 Oh, and Happy Belated Macaron Day, New York City! Price point: one free macaron per person from each participating bakery on Macaron Day, $2.65 for a raspberry-filled beignet from Almondine Bakery, $6 for two square doughnuts from DessertTruck Works, $12 for a box of 6 macarons from Cours La Reine.